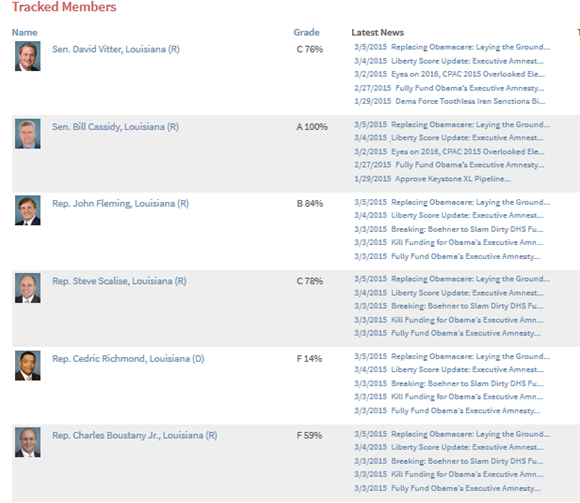 Conservative Review’s most recent rating of the Louisiana delegation does not look good for those in the Acadiana / Lake Charles / Southeast Louisiana region being “represented” by Congressman Charles Boustany. In a comparison to the rest of the Louisiana delegation in both chambers, Boustany scored a resounding “F” on the graded scale from that organization. Unsurprisingly, he considers the most conservative members of the conference in the House – the more newly elected tea party aligned members – not to be conservative. "Look at payroll tax. Look at fiscal cliff. You can go on and on. There are a handful of members – the numbers sort of vary, it’s in the 20-30 range – that are enough to derail a Republican conservative agenda in the House." He is also a strong critic of those conservatives that want to continue fighting for repeal and defunding of Obamacare. He supports the expansion of Medicaid in Louisiana. Boustany has continually aligned himself with the establishment in DC, such as Speaker of the House, John Boehner, and has shown himself everything but the conservative alternative that he claims to be. All of those in the region that he represents that hold to conservative values should be appalled that he is one of the most liberal members of Louisiana’s delegation. Posted on March 10, 2015 by Christopher J. Gary and tagged LA03 charles boustany louisiana.